Artificial Gainda Flower Decoration Strings which have fabric flower and beads to make them a strand. The color and size options are available. The decoration can be used for all event and locations. Multicolor Artificial Flower Ball Strings for decoration at all occassions, events, mandaps, parties, etc. 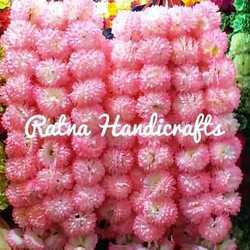 There is a huge variety available with us (Ratna Handicrafts). 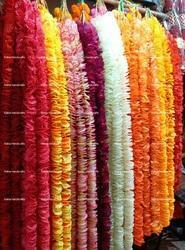 Artificial Big Size Flower Decoration Strings which have fabric flower and beads to make them a strand. The color and size options are available. The decoration can be used for all event and locations. Fluffy Artificial Flower Ball Look Garlands made in Satin Cloth for decoration at all times. The item is unique and provides a special look when used for decoration. 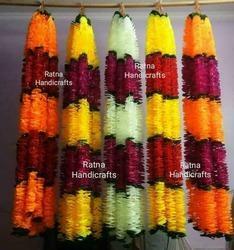 Artificial Flower Decoration Garland are thick garlands with a very heavy look which can be used for decoration at all times. 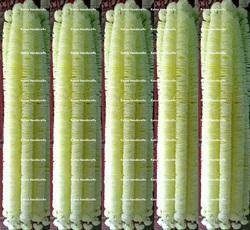 Artificial flower decoration strings for all occassion and events. Color customization is possible at all levels. 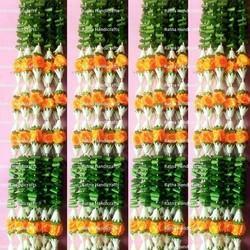 Artificial jasmine flower decoration strings in heavy look. These are bud form of jasmine which gives a unique look of decoration. Colors options are cream and white. The length can be customized.